(The Stables of Don Juan of Austria / Le Haras de Don Juan d'Autriche) published in Antwerp in by Ph. Galle, circa 1580. 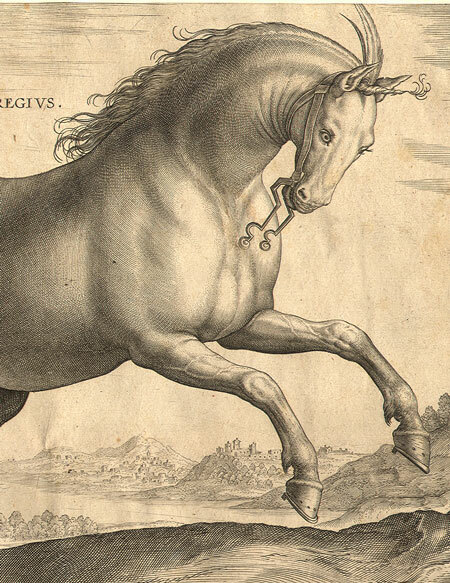 These engravings depicting the horses of Don Juan of Austria, Governor-General of the Netherlands from 1576 to 1578 were designed by by Jan van der Straet (Stradanus) and executed between 1578 to 1580 by prominent Dutch engravers including Adriaen Collaert, Hieronymus Wierix, and Hendrik Goltzius. Don Juan of Austria was the illegitimate son of Charles V and a half-brother to Philip II (1555-1598), King of Spain and the Netherlands. He lead Spanish troops to their decisive victory against the Ottoman Empire at the Battle of Lepanto (1571) and became Governor-General of the Netherlands in 1576. He died of the plague in 1578. 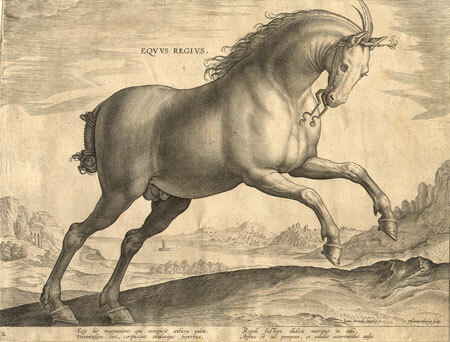 It was in the Netherlands that Stadanus drew Don Juan's collection of horses from the different regions of Europe. Jan Van der Straet (1523-1607 - also known as Joannes Stradanus, Giovanni Stradano, van der Straat or Stratesis) was a flemish artist from Bruges who became a court painter to the Medicis and was active mainly in Florence. Born in Bruges in 1523, Van der Straet trained with Pieter Aertsen in Antwerp. He moved to Florence around 1550, where he entered in the service of the Medici Dukes and was associated with Giorgio Vasari. He worked in Rome as part of the artistic team decorating the Vatican Belvedere and was also involved with the decoration of the Palazzo Vecchio in Florence. This magnificent copperplate engraving is an original 16th century late Renaissance print on old hand laid paper - it is not a reproduction. Condition: Cut to platemark. Some reinforcing of sheet on left edge of reverse. Toning of sheet. Otherwise excellent. Very sharp clear impression. The print shown above is an antique original. We also offer reproductions of this engraving via our shop on Zazzle. Click on the images below to visit the product pages in our Zazzle store. Browse other horse gifts from Antique Images on Zazzle.